Drugs, International Challenges n° 10, OFDT, 7 p.
Captagon, in the overwhelming majority of cases, aside from the classic "fakes", is now simply another "street name" for amphetamine or speed. This relatively commonplace substance was, until the 2000s, manufactured by Balkan, Bulgarian and Turkish networks, specialising in the synthesis of amphetamine and its transformation into tablets. Owing to law enforcement actions, part of production appears to have relocated closer to consumer markets in the Persian Gulf, and to Lebanon in particular, as shown by combined seizures of precursors, amphetamine and captagon tablets. This must be understood in the context of armed violence in the Middle East, with the outbreak of the Syrian Civil War and the break-up of Iraq, notably due to the activities of the jihadi armies. These combined events have helped sustain a series of rumours and allegations. 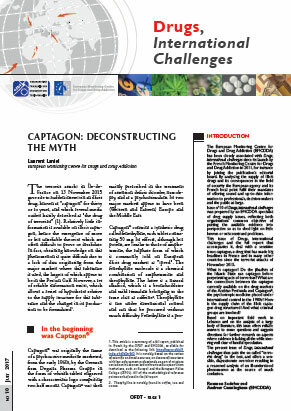 The one often rehearsed in the media, that "commonplace" captagon is the "jihadi drug", the substance preferred by Daesh terrorists, especially in France, has been refuted by objective findings, and will remain mere speculation until proven otherwise.